So even with my screw up yesterday when I somehow cut the starboard outwale too short, I'm pretty pleased with the way it turned out. The 5 inch piece I fitted on after I got the rest of the piece on is blended pretty well even though it's just butted, not scarphed. Once it's sanded down it won't be too noticeable (except to me). 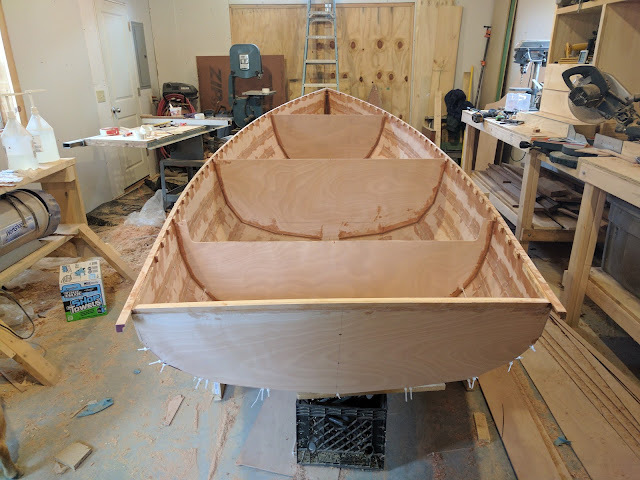 The best part of last night's work is that the boat has really stiffened up a lot now that both outwales are on and the curve of the top strake now seems totally fair. I wanted to pull the boat and flip it today, but it was raining so hard I didn't dare. I'm sure it would be fine since it is BS1088 marine plywood that should have waterproof glue, but I didn't see the point. Instead I decided I would fit the quarter knees and the outboard stern rail (the trim on the back of the boat, not sure what it is called). I thought it would be quick, but it ended up taking a ridiculously long time to get everything nice and tight. It was fairly satisfying though, I love shaping wood and a low angle block plane and my shinto rasp are some of my favorite tools for hacking up wood. 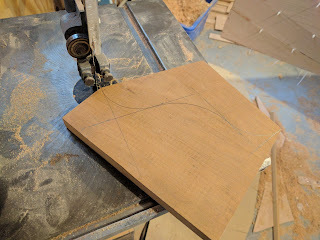 I started with the stern rail and the low angle block plane to sneak up on the cambered line and when I was close, I went to the rasp to get the last bit. Once I was satisfied with the general shape, and that it matched the slight camber of the inner one I moved onto the quarter knees which should also help stiffen up the boat even more once they are glued and screwed into place. For the knees I found a nice piece of wide Honduras mahogany board and transferred the general angle of the transom to strake intersection onto the soon to be knee. 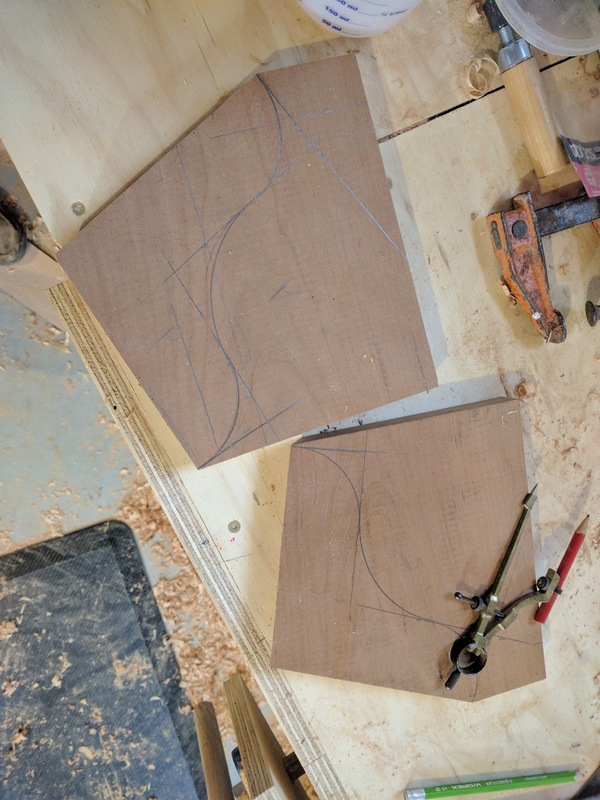 I oriented the board so that the grain was diagonal across the knee for the best strength and then used a compass and ruler to make the curves that will be exposed inside the boat. 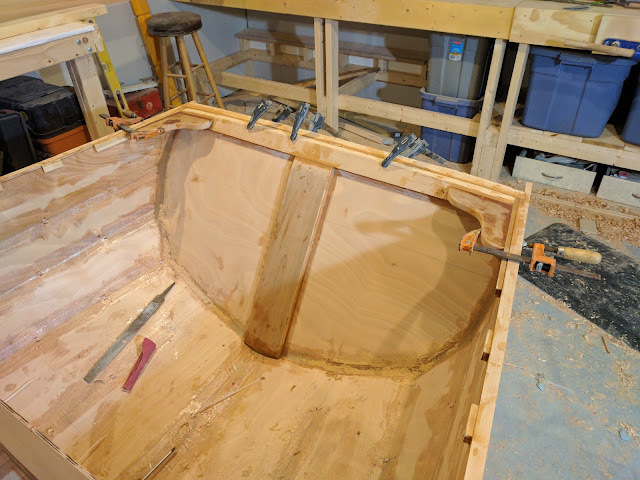 It took a few test fittings to get the initial angle (there are 2 dimensions; fore - aft, and up - down), but eventually it sat perfect in the crook between the strake and the transom. I cut out the rough inside shape with my band saw, but could cut the tight curves with the blade I have on it right now, so I settled for close, and made multiple passes at different angles to get most of the waste wood cut away. Then it was back to the shinto rasp for final shaping and some 80 grit paper to cleanup and radius the edges before epoxying it all in. I didn't have any screws long enough to go through the rail and solidly into the knees so I will have to do that after it all dries up and I can get to the hardware store from some 2.5 inch SS screws. Unfortunately, I won't be able to do any work on the boat this weekend so the boat flip will have to wait until next week when the weather gets a little better. The shop is long overdue for a serious cleanup and I want to be able to move the boat out for a few hours so I can clean and sweep before moving it back in and starting on the bottom.